#FIBAOQT: Gilas Pilipinas vs. France Results, Full Video Replay(July 5, 2016) - Balita Boss! Gilas Pilipinas, the Philippines men's national basketball team, will open its 2016 FIBA Olympic Qualifying Tournament (OQT) campaign against France. Both teams are members of Group B, which includes New Zealand. 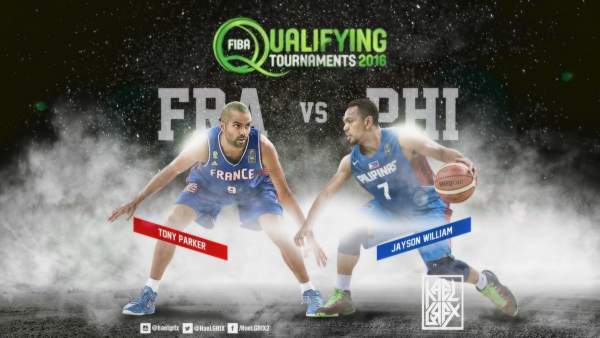 Here's the 2016 FIBA Olympic Qualifying Tournament information for France vs. Philippines. One of the most anticipated matches for Filipino crowd, France versus Gilas Pilipinas will be broadcast live on TV5 and HYPER on CIGNAL in the Philippines. The free official live streaming video of France vs. Philippines is embedded above courtesy of Sports5 YouTube Channel. France national basketball team ranked fifth in the world by FIBA, will be led by NBA player Tony Parker and Boris Diaw of the San Antonio Spurs. Other NBA players who will represent the colors of France are Nicolas Batum of the Charlotte Hornets, and Joffrey Lauvergne of the Denver Nuggets. The other players that included in the France's Final 12 are Nando De Colo, Antoine Diot, Mickael Gelabale, Thomas Heurtel, Charles Kahudi, Adrien Moerman, Florent Pietrus, and Kim Tillie. According to their coach, Batum isn’t expected to play against the Philippines due to his contract with the Hornets. Gilas Pilipinas, which leaped to no. 28 in the latest FIBA world rankings, is leaning on naturalized player Andray Blatche, Terrence Romeo, and Asia's best point guard Jayson Castro to carry the team as they look for a massive upset against powerhouse France.